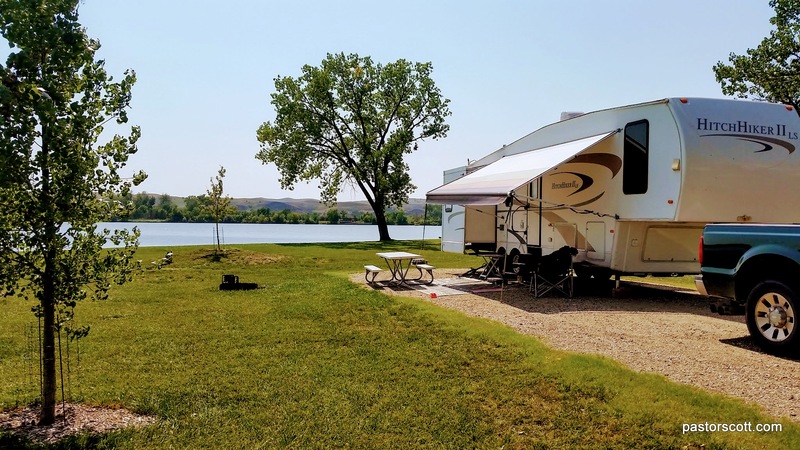 After driving nearly 200 miles across the corn and hay fields of the South Dakota Prairie we dropped into the Missouri River Valley and arrived at a beautiful lakeside campground on the outskirts of Pierre, SD. Farm Island Recreation Area is a pretty spot with large, level sites and 50 amp electrical hookups. There is a convenient water and dump station near the entrance. We arrived, happily with reservations, on an August Friday afternoon and the campground was nearly full. There were many families and the kids had a blast swimming in the lake. The lake is fed by the Missouri River. It has a sandy bottom and is pretty shallow for a good distance out – making it perfect for children. 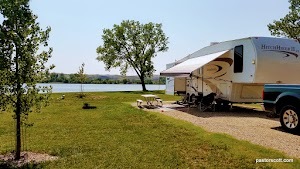 Because of the layout of the campground only a fourth of the sites are by the water. Because of that, people pretty much walk through those sites to get to the lake. I know some people get bent out of shape when that happens, but at this campground it’s just the way it is. We smiled and said “hello” and they smiled in return. By Sunday evening, though, that was all over. The place was nearly empty and we pretty much had the campground to ourselves the rest of our stay. Here are a few things you might want to know if you plan on visiting Farm Island. 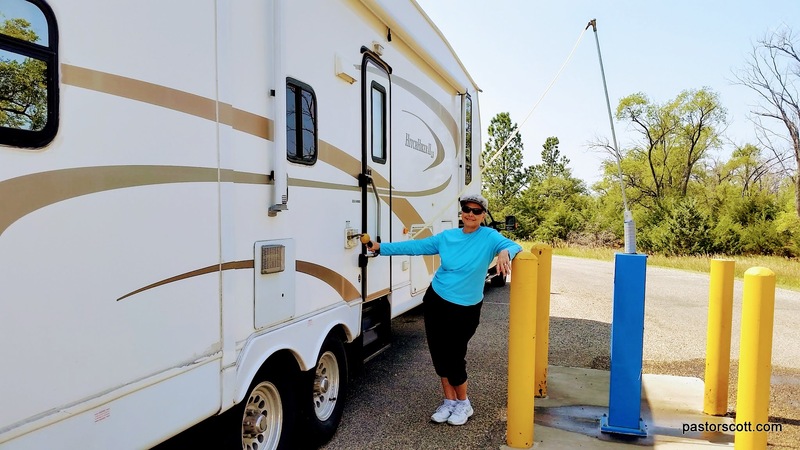 In addition to the camping fee there is a South Dakota State Parks vehicle entry fee of $6 a day. Since we were intending to stay four days and then visit Custer State Park later on we got a $30 annual pass instead. There is also a $7.50 out of state booking fee. I had no problem getting satellite TV which is a good thing because I don’t think there was any over the air TV. My Verizon signal was solid. When I tested the water with our TDS meter it reported numbers as high as 1000. That’s really high and at the limit of what is considered fit for human consumption. I suggest you bring drinking water. Finally, the flies are real pests throughout this area. Be prepared to defend yourself unless the wind is blowing. 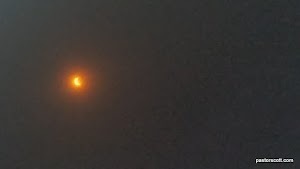 Our final day at Farm Island was “eclipse day.” We woke to a severe thunderstorm that was pretty scary – wind, hail, and a downpour. Really, we should have bugged out to one of the shower houses. However, the storm was on us before we knew it. After 10 or 15 minutes of (thankfully) small hail, things let up. 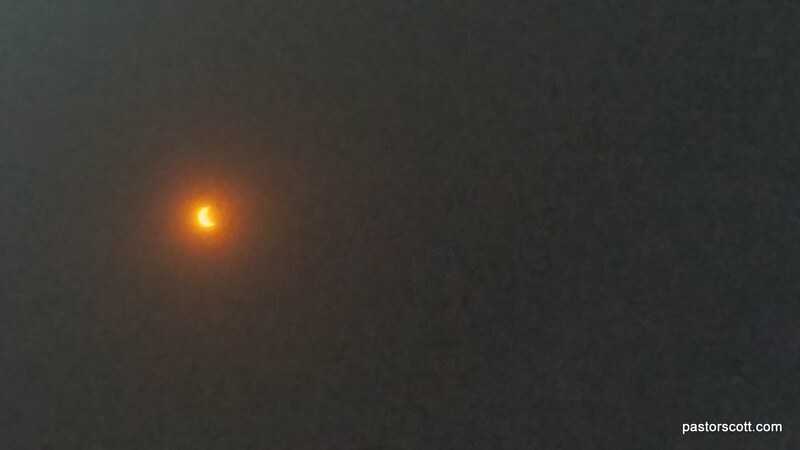 We feared the heavy clouds would block our view of the eclipse which was at nearly 90% for the area. However, at just the right time the skies cleared and we had a good view of the impressive display of God’s handiwork. 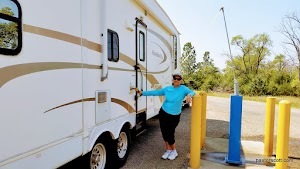 This entry was posted in Scott and tagged camping, Children, full time, fulltime, review, South Dakota, state park, weather. Bookmark the permalink.